Japanese sushi can be served on special Japanese dishes. Order here your special sushi serving dish or one of the nice sushi boats. In Japan, a sushi geta (bamboo serving plate) is often used to serve fresh sushi or sashimi on. 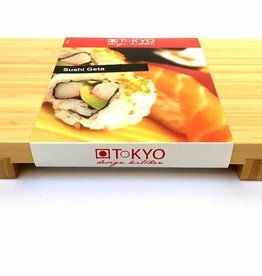 This sushi geta (serving plate) gives an extra dimension for serving Japanese sushi. The sushi geta is made from bamboo. The scale has a very palpable relief and is of excellent quality. The scale is made of fine quality Japanese ceramics. 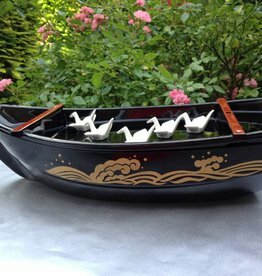 This funny sushi boat can be used to serve sushi. Moreover, the dishwasher is resistant and suitable for catering.